Neem Oil Shampoo is great for people and for dogs! For People And For Pets! Let's look at neem shampoo and neem dog shampoo... What is neem shampoo used for? Where can you buy it? And how do you make your own shampoo with neem oil? 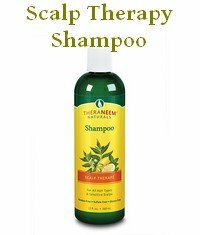 Shampoo with neem oil is great for people and great for pets! 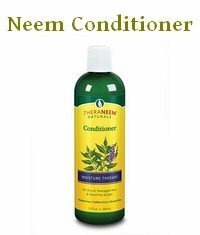 Neem shampoo is a shampoo that contains some neem oil or neem leaf extract or both. The oil and the leaf extract have similar active ingredients, but in varying concentrations. Both are fantastic for skin and scalp health. Neem oil can relieve dry and itchy scalp, dandruff, the symptoms of scalp psoriasis, as well as giving you silky, shiny, stronger hair and encourage growth. It really makes a big difference, and it does so seemingly over night. See the page about neem hair oil for more info on using the oil by itself on your hair. Shampoo made with neem oil or neem leaf does have all the same benefits. But it smells better and is a lot easier to use. However, the effect is not as instant as with a neem oil treatment. Your hair is in contact with a shampoo for only a short time, but it will be treated a lot more often. You can use neem oil shampoo on a daily basis. Who has time to do oil treatments daily? I don't! So if you are dealing with a serious hair problem and want rapid relief, try a neem oil treatment. To maintain a healthy scalp and healthy hair, use the shampoo. The most popular reason for using neem oil shampoo however, is a totally different one: head lice! The neem tree is better known for its insecticidal properties than for the skin and hair care benefits it provides. And it works! Both researchers and users report great results when using shampoo with neem on head lice. By the way, you don't even need to buy expensive neem shampoo, you can make your own. Simply put, everything I just said for people is true for dogs and other pets as well. Does your dog have skin problems? Itches or bald spots? Or is it being harassed by mites or fleas? Try neem pet shampoo. Mange is the dog equivalent of scabies. Neem oil works for both and so does shampoo with neem. Read more about using neem for dogs. 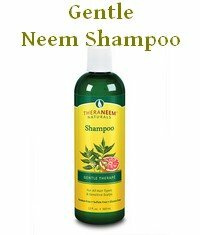 Where Can You Buy Neem Shampoo? Unfortunately you won't necessarily find neem products in your local supermarket or drugstore, though the number of stores that do stock the odd neem product is slowly increasing. Your best offline bet are the health food shops. Still, the easiest way to find neem shampoos (and the best prices) is to look online. 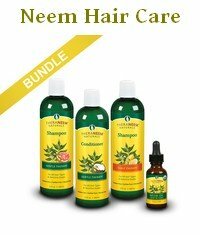 On this page you can find a great selection of neem hair care products from reputable companies. If you are looking for something for your pets, try this page. Of course you can also always try Amazon but be careful there. Not everything that says neem on the label is a high quality neem product. Adding a spritz of neem to otherwise conventional products does not change the quality or effectiveness! Raw neem oil is easier to find, cheaper, goes a long way and can be used in a million ways. 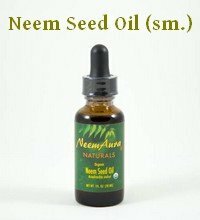 Again, the best place to look for neem oil is online, followed by the health food stores. Garden centers are another good place, as gardeners highly value neem oil for its insecticidal properties. But check the ingredients carefully! If you don't want to go hunting around garden centers or hardware stores, you can find quality, pure, organic neem oil, both in large amounts or as small bottles with droppers, here.